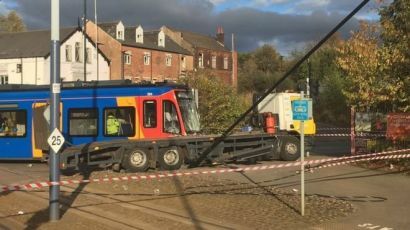 A COLLISION between a tram-train and a lorry on the opening day of the new service between Sheffield and Rotherham caused the suspension of both tram train and conventional tram services for some hours, but Stagecoach says both types of service are now running again. The collision occurred on Staniforth Road in Attercliffe yesterday afternoon, where the tram line is also used by ordinary trams on the Yellow route. No one was reported injured in the incident, and the Rail Accident Investigation Branch has been informed. Some roads in the area were also closed for a time. The launch of the new tram-train service had been delayed by several years, but the tram-trains now provide a direct light rail link between Sheffield city centre and Rotherham, by using normal railway track between Tinsley and Rotherham.